In the 1960s, everyone greased up with baby oil and took a reflector screen up to their face (or lay on a reflector blanket) under full sun to bake on that glow. The major ad campaign at the time was getting Coppertone—the name of a product that promised a tan—a faster, deeper tan. The ad’s main icon was a little girl with blond pigtails and her dog has playfully pulled down the back of her swimsuit, so you can see the tan’s demarcation line, with the subhead, “Don’t be a paleface!" When people had a tan in the winter then, they were thought of as well-to-do. It became a status symbol to get a St. Tropez tan—for the sleek, exciting woman, who, when she walked into a café at night, the patrons put down their wine glass to look; she had a Bain de Soleil tan. Fast forward to today. A tan is not healthy. Ultimately, sunburn is damage and death to cells in the epidermis layer. Researchers say it is ultraviolet damage that causes free radicals to spawn oxidative stress and that makes for DNA damage. It is inflammation and induced cell death. According to David McDaniel, doctor and director of the Institute of Anti-aging Research, the anatomy of sunburn redness is an indicator you’ve reached what’s called, MED or “minimal erythemal dose," the amount of exposure each person needs to burn their particular skin, which varies from person to person. Dermatologists have a skin classification system—the Fitzpatrick Skin Type developed in 1975 by Thomas Fitzpatrick, MD, of Harvard Medical School —to determine who is at the highest risk for burns and skin cancer. The scale and a subsequent quiz is published on the Skin Cancer Foundation website. When sunburns became associated with melanoma, a form of skin cancer, the most important way to prevent it was to limit exposure to ultraviolet rays (UV). So late in the 60s the first sunscreens, or sunblock, appeared to protect against sunburn. It wasn’t until the 1970s that SPF labels or the sunblock factor was first introduced. In 1978, the Food and Drug Administration set about to recommend standards for safety and effectiveness for sunscreen, but the guidelines were sketchy and a strained variety of rulemaking for over-the-counter sunscreen drug products was spawned. 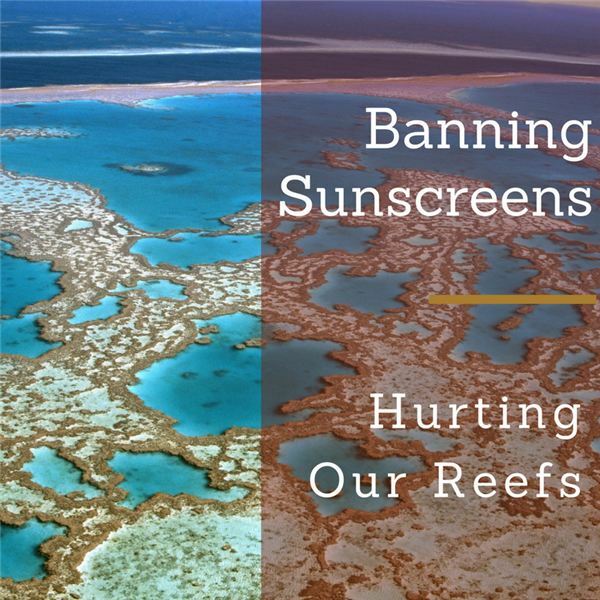 And now the problem is, sunscreen is a definite danger to coral reefs (and us too). In 2016, a Coral Reef Symposium was held in Hawaii and studies were presented from 327 different coral colonies in places such as Puerto Rico, Florida, the U.S. Virgin Islands and more. Research found that in some areas coral couldn’t reproduce. A kind of swimmer pollution was washing off swimmers’ skin and left ultraviolet-blocking chemicals in the water like oxybenzone. It looked like shiny, iridescent oil floating on the water. The toxicological effects were that it induces coral bleaching, by lowering the temperature at which corals fail under heat stress; the chemicals are also genotoxic, which means it damages the DNA of living coral, causing the larvae to have severe and lethal deformities. And oxybenzone also creates gender shifts in fish and inhibits embryonic development. Some scientists called the reef mainstay, “zombie corals." Unfortunately, for people, the chemicals mimic the body’s natural hormones and can confuse human body systems as well. Besides the fact that reefs are beautiful in the ocean, they provide a home for about 4,000 different types of fish. Not only that, but it is a birthing ground for a huge variety of sea life like sponges, crustaceans, mollusks, crabs, shrimp, sea snakes, turtles, sea urchins and hundreds other cooler looking and interesting forms of life. The coral is a not only a backdrop, but acts as a nursery, refuge and hiding area for thousands. In addition, the structure itself is what’s called a natural “breakwater," which means it’s a barrier that breaks waves and that means it breaks down the impact of sea storms, hurricanes, typhoons and other weather phenomenon. It is critical for protecting coasts from erosion. In addition, it’s hard to put a price tag on the tourism that reefs create for divers, ocean lovers, snorkelers, fishermen, and other water enthusiasts from photographers to people who seek out new medicines and treatments for disease. And what about all the thousands of people living near these coral reefs that serve tourists and beach communities in coastal cities? It provides a sustainable means of earning foreign currency and creates employment, even in remote areas of the world. To protect Hawaii’s precious coral ecosystems, their state’s lawmakers passed a bill May 1, 2018, that prohibits the sale and distribution of sunscreen containing oxybenzone and octinoxate. If the legislation is signed fully, it will take effect on January 1, 2021. Look for a biodegradable sunscreen if you must use it at all. Apply it only to neck, face and the back of your hands. Beware, some brands labeled “reef friendly" are not really so; be skeptical and read the ingredient list. Some resorts and coral reserves have banned them altogether. The best effort for you and yours however, would be to buy and wear UV protective clothing. There are some cool rash guards, swim tops, and hats that can reduce the threat. Sun protection clothing from lines including Patagonia, Coolibar and REI are rated with UPF, or Ultraviolet Protection Factor, ratings similar to what sunscreens use for SPF, Sun Protection Factor, numbers. Then to, pick up a nifty, collapsible cabana or carry an umbrella to pitch in the sand. Make your own little protection hut. Eriksen, Marcus.“ Toward a Plastic-Free Polynesia.” National Geographic Traveler. June/July 2018: Pages 30-31. Print.